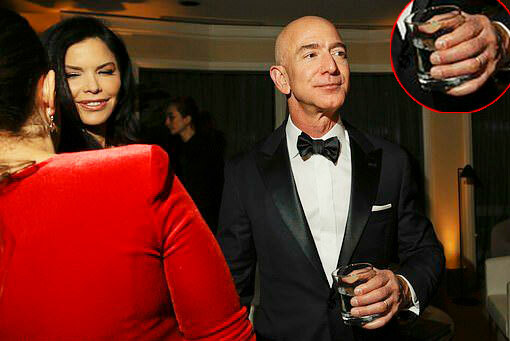 Amazon CEO Jeff Bezos was seen wearing his wedding ring at a Golden Globes party on Sunday, January 6, alongside his reported mistress Lauren Sanchez just days before he announced his split from wife MacKenzie. A photo taken by The New York Times showed Bezos, 54, wearing a tuxedo and holding a drink in his left hand as he stood beside the former TV host, 49, at Amazon’s afterparty at The Beverly Hilton hotel in Beverly Hills on Sunday. The National Enquirer reported on Wednesday, January 9, that the billionaire businessman and Sanchez, who is married to his friend Patrick Whitesell, have been seeing each other for eight months. The outlet, which has obtained photos of the pair as they enjoyed trysts across five stares, claims that Bezos and Sanchez’s respective spouses were recently made aware of the relationship. Bezos — who Forbes named the richest man in modern history after his net worth increased to $150 billion in 2018 — and his wife announced their split on Wednesday in a joint statement. For more details on the affair, pick up the new issue of the National Enquirer, on newsstands Thursday, January 10.